The robo advisor believes its new automated financial planning tool is more personal and connected than a human advisor could ever be. With its main competitor moving further towards traditional wealth management, Wealthfront is doubling down on its bet that fully automated advice is the future. Now, the Silicon Valley "robo advisor" is introducing automated financial planning, which Founder and Chief Strategy Officer Dan Carroll believes makes the tool more personal and connected to investors than a human advisor could ever be. “Going to a human advisor is completely dehumanizing,” Carroll told Wealthmanagement.com. “If you meet twice a year get a single form—they don’t know your life." Wealthfront is calling the new service Path, and it puts financial planning at the center of the digital experience. Path aggregates data from all of a user’s accounts connected to Wealthfront to automatically determine how much a client is saving and spending. Thanks to an integration with Redfin, Path can factor in the value of a customer’s house, which Carroll said is valuable for Wealthfront’s client base of young professionals. Its algorithms also make their own assumptions about Social Security, inflation and investment returns, to spare clients from guesswork required by most retirement calculators. “We then use your actual behavior to forecast the future; not what you say you want to do, but what you are actually doing,” Carroll said in a Wealthfront blog post detailing Path. 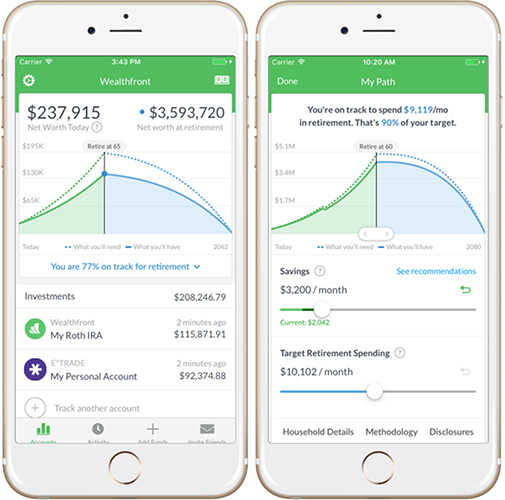 Path gives advice on where customers should save for retirement, prioritizing tax-advantaged and low-fee accounts, and factors in annual contribution limits. Carroll said the algorithm gives unbiased advice, even if it means contributing more to a held-away retirement account rather than the Wealthfront brokerage account. Carroll says Path was designed specifically for use on a mobile touchscreen, with factors like retirement age, savings and spending all adjustable by sliding scales. The idea is to let people get answers to simple financial questions, such as how much more a person should start saving after a raise, or if they can retire and travel the world, without having to schedule an in-person meeting, phone call or even video conference session with a financial advisor. “Young people want the service and to get it right now,” Carroll said. “They don’t want to use Skype. If an advisor thinks clients want to Skype, they’re crazy." So, how does Path compare with digital financial planning tools available for advisors? Carroll said Wealthfront’s is a better mobile experience and delivers what young investors actually want, not what financial institutions think they want.